The pages of America have lately been filled with articles on the question of liturgical translations. Bishop Donald W. Trautman, former chairman of the N.C.C.B Committee on Liturgy, and Cardinal Jorge A. Medina, head of the Congregation for Divine Worship and the Discipline of the Sacraments, have addressed the controversy that has developed between Rome and the International Commission on English in the Liturgy (ICEL) on the problem of liturgical translations (America, 3/4 and 5/16). Earlier this year Bishop Maurice Taylor of Scotland, the current chair of ICEL’s governing board, had received a letter (dated Jan. 14) from Archbishop Francesco Pio Tamburrino, who is secretary of the Roman congregation. The letter directed ICEL to ensure that publication and distribution of its controversial translation of the psalms be ceased on the grounds that the text is doctrinally flawed. On April 25 the presidents of English-speaking episcopal conferences and ICEL board members met in Washington, D.C., to discuss, among other things, how to revise ICEL’s constitution to meet the current concerns of the congregation. The purpose of this article is not to enter the current fray as such, but to shed light on an underlying problem regarding liturgical translationsnamely, fundamental principles of translation. I will address two issues: 1) linguistic problems in the translation of biblical texts, and specifically, the psalms; and 2) fundamental principles of biblical and liturgical translations. In addition to ICEL’s translation, I will refer to the following translations: Revised Standard Version (RSV), New Revised Standard Version (NRSV), Revised English Bible (REB), New Jerusalem Bible (NJB) and the New American Bible (NAB). Although the doctrinal problems with ICEL’s text on the psalms have not been specified, one can surmise from earlier controversies about the translation of the new Catechism of the Catholic Church and the revised American Lectionary that the issues probably embrace two areas: inclusive language and messianic interpretation of the psalms. One would find it difficult to believe that inclusive language alone is the focus of doctrinal concerns, given that the Vatican has already approved certain changes in liturgical texts for reasons of inclusivity. Three examples are: the change, made in 1981, of the words of institution during the Mass (excluding men from the formula It will be shed for you and for all men); the approved Sacramentary and Lectionary for Marian celebrations (1992), which use inclusive texts; and the newly revised Lectionary (1998), which uses moderately inclusive language when referring to human beings. More than likely, there is serious concern about the messianic psalms. The focus of attention is usually on Psalms 2, 8 and 110, which have messianic dimensions. Psalm 2:7 (You are my son; today I have begotten you NRSV) is alluded to in the New Testament at the baptism of Jesus (Mk. 1:11). The ICEL rendering, You are my son, today I give you birth, does not appear to be problematic. In any case, the Hebrew text refers to the enthronement of the king, which later Christian tradition applied to Jesus as the Christ. NRSV ...what are human beings that you are mindful of them, mortals that you care for them? Yet you have made them little lower than God, and crowned them with glory and honor. ICEL... what is humankind that you remember them, the human race that you care for them? You treat them like gods, dressing them in glory and splendor. Among scholars the original meaning of the text is not in doubt. The psalm contrasts human insignificance with God’s grandeur. Yet in the New Testament, this section of the psalm is specifically applied to Jesus as a Christological statement (Heb. 2:5-8). The RSV’s more literal and traditional translation preserves this Christological sense as interpreted by the Letter to the Hebrews; ICEL’s and the NRSV’s do not. This indeed raises a doctrinal issue, but the issue goes beyond translation into the realm of hermeneutics, touching on the complex relationship between the New and Old Testaments. In such instances, I think it prudent to retain the traditional translation, but one should recognize that this is not a frequent occurrence. But there is a more fundamental issue at stake. It concerns basic principles of biblical and liturgical translation that should provide common ground to direct the work of professional translators. I propose seven basic principles for biblical and liturgical translation. 1. Language is a living reality. By nature, language changes with usage and experience. Human beings communicate with words, but words can change their meanings over time. Translation moves from the source text to the receptor text. While ancient words in the source text might have well-established meanings that are fixed in the tradition, the translation of these concepts into the living languages of the receptor text requires attention to the precise meanings of the receptor language. Ronald Knox, whose famous biblical translation still stands in the American context as a remarkable feat, summarizes this aspect of language well: Words are living things, full of shades of meaning, full of associations; and, what is more, they are apt to change their significance from one generation to the next. The Latin word homo (or Hebrew adam and Greek anthropos), for example, was properly translated man in an earlier era, but contemporary English usage of the word man has shifted culturally, with the result that man no longer conveys what the original Latin word conveys. 2. The process of translation involves primarily two interrelated values: a) preserving faithfully the meaning of the original text and b) enunciating the original text in clearly understood terms of the receptor language. In my judgment both values are essential for accurate translation. A literal translation could, for instance, lead to a total misreading of the original text because the words were translated but not the meaning. Fidelity to the original might well require a less literal translation in the receptor text. One must also consider what the individual words in each of the languages might mean. When the Old Testament speaks of God’s anger, an anthropomorphic expression is often used (nostrils flare or nose reddened). These literal expressions would hardly be suitable for liturgical translation and, in fact, do not accurately convey the meaning of the text. 3. Translation can be seen as a continuum on a scale of three main categories: a) formal translation, b) functional translation and c) free-form translation. Although it is common to bifurcate the task of translation into two categories of formal and dynamic equivalence, I think this threefold division is better. It diffuses the tendency to see translation as only an either/or proposition. The first category, formal translation, is the more literal style of translation in which each word is produced as nearly as possible to preserve both the sense and the form of the original. The second approach, functional translation, translates more fluidly, not by replicating words and form but by conveying the meaning of the original in the proper form of the receptor language. The third category, free-form translation, is commonly called paraphrase, because it is more an interpretive rephrasing of the text than a translation. From a doctrinal perspective, paraphrases are more suspect because they can resolve ambiguities in the original text in ways that are better left unresolved. Take, for example, the literal expression in Ps. 29:1, sons of God (NJB). Variations include heavenly beings (RSV, NRSV and NAB), spirits (ICEL) and angelic powers (REB). That the reference is to divine beings is not in question, but just what expression best enunciates their identity can be difficult to determine. Compare also the meaning of the Hebrew word siyyim (Ps. 72:9), whose meaning is somewhat obscure. Variations extend from foes (NRSV) and enemies (ICEL) to desert tribes (REB) and the Beast (NJB). Context (which I think favors the first two choices) is the only real aid in this case. The issue becomes more complex with sentences and clauses. 4. There are good and bad translations, but they do not always coincide with the categories of literal and non-literal. The NJB translation is generally acknowledged as a poetic and interpretive enterprise, yet it has seldom been critiqued as doctrinally flawed or a bad translation. Bad translations exist when ideological issues take precedence over the text. For example, substituting the mighty hand of God for the right hand of the Lord (e.g., Ps. 118:16), as some translations have done, on the grounds that the latter is offensive to left-handed persons, is poor translation. Likewise, substituting the word captivity for darkness (Ps. 107:10) or avoiding altogether the light/darkness contrast so frequent in the Bible, on the grounds that the latter offends people of color, is tendentious. 5. Every translation is an interpretation. The Italian proverb expresses it best: traddutore, traditore (translator, traitor). There is no pristine way to accomplish translation. As others have noted, translation is as much an art as it is a science. If this principle is acknowledged, then it must be seen that not even a literal word-for-word translation constitutes the same reality as the source text. Words in any given language have a multiplicity of meanings and shades of nuance that do not permit one-to-one correspondence into other languages. Translation requires more than fidelity to the original text. What a text says and what it means can be two different things. For example, the Hebrew expression bene Yisrael literally says sons of Israel, but most of the time it means the Israelites as a people. It is not exclusive of women. Literal translations do not always convey the proper sense of a text, a notion supported both in Cardinal Medina’s recent letter and in the Pontifical Biblical Commission’s document The Interpretation of the Bible in the Church (1993). 6. Translation must also take into account the influence of culture. If fidelity to the original text is always viewed as the ultimate value, serious mistranslation can occur. One only need ask the experience of expert Bible translators who have undertaken the task of translating biblical texts for very foreign cultures (African, Asian, indigenous peoples, etc.) to know how serious this problem is. For example, the use of the biblical image of sheep and goats and shepherds (Ps. 74:1; 80:1; 95:7) in a culture that has experience only of cattle, as in the case of some African peoples, can be problematic. This type of cultural situation is widely recognized by Bible translators working under the auspices of the United Bible Societies, yet it does not seem to be acknowledged as readily in liturgical translation. This situation points to a serious problem in the use of international commissions for the translation of universal liturgical texts. There is the danger of overlooking this cultural setting, even among countries using the same language. English is no exception. Remember Winston Churchill’s remark that Americans and the British were two peoples separated by a common language? Actually, Irish, British, Australian and American forms of English contain more than merely differences in accent. There are structural and idiomatic differences, as well as differences in vocabulary, that pose hurdles to the production of effective contemporary translations. One notes, for instance, that in the United Kingdom the word Lord or lord does not carry the same inference as in American English, since it is still used in reference to positions of authority unrelated to gender (e.g., Lord Mayor). ICEL properly retained this usage for Hebrew adonai in reference to God. 7. Liturgical translation requires attention to unique aspects of translation not common to biblical translation. Translating liturgical texts is not like translating a legal contract, in which literal meaning might hold sway. There is no room for textual notes or explanations of variances in translation when a liturgical text is intended for public worship. The primary purpose of liturgical translations is to foster prayer. The context of prayer requires special attention to both oral and aural dimensions of a text. Moreover, liturgical translations demand serious attention to poetic sensitivities and the use of subjunctive and hortatory modes of expression. Interestingly, ICEL has been criticized, at times even by supporters, for mundane and inelegant translations that inhibit the lifting up of one’s soul in prayer. Is ICEL’s translation of Ps. 24:1, God owns this planet and all its riches, as inspiring as The earth is the Lord’s and all it holds (NAB)? I don’t think so. At the heart of the present controversy is, I believe, a lack of agreement on the fundamental principles of translation and how they apply to liturgical texts. Can we assert that most controversies over liturgical translation are strictly doctrinal in nature? In my estimation, although there are doctrinal aspects that should be respected in translation, they are not very frequent. Much of the controversy relates to the linguistic issues involved and to what appear to be different sets of operating principles. In order for ICEL and the Vatican to agree on the outcome of future translations, there needs to be more common ground from which a dialogue can proceed. The revision of ICEL’s constitution is perhaps a step in that direction. 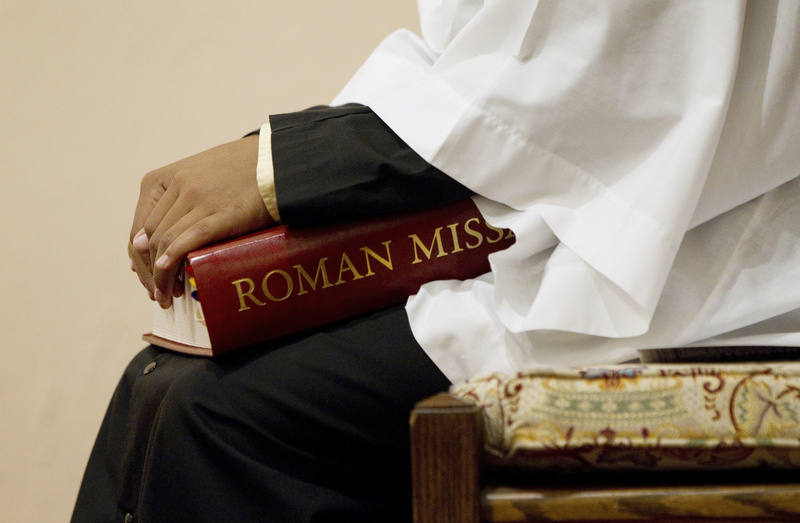 Yet another task might be the revision and updating of the official Roman text Comme le Prévoit (1969), which has guided the church’s production of translations in the vernacular for more than 30 years, the review of which is underway. The above principles are not intended to be comprehensive; other complex issues would have to enter the discussion. But much is at stake in the conversation. Good biblical and liturgical translation is essential to the life of the church. There are objective ways of ensuring qualitative translations that are both elegant and faithful to the original text. Care must be taken not to overestimate the number of translational issues that are truly doctrinal in nature. Agreeing on common principles of translation would be a step forward. The article by Ronald D. Witherup, S.S., (10/7) gave a former “translator” great satisfaction. I said to myself: They should send it to Vatican City. But then, after relishing that thought for 24 hours, I realized that it would, perhaps, have to be translated, and then the difficulties might start. I believe that the masterful article, “ICEL and Liturgical Translations” (10/7), by Ronald D. Witherup, S.S., will go down as a milestone on the long, difficult road to a faithful, noble and elegant translation of the Latin liturgical texts into English. His article was balanced, respectful and insightful. Father Witherup dropped a bomb when he said that “the situation points to a serious problem in the use of international commissions for the translation of universal liturgical texts.” I’ve never heard of this idea. But it makes much sense. Perhaps we should leave it to the individual episcopal conferences of the different countries to translate their liturgical texts so they have their own cultural flavor. I know that there is no uniform Spanish translation for Spain and the Spanish-speaking countries. Colombia, for example, has its own because of the language and cultural nuances. There might even be some healthy competition among the English-speaking episcopal conferences to translate the liturgical texts with as much fidelity, nobility, poetry and music as possible. As someone who has done a bit of translating now and then, I enjoyed reading the article, “ICEL and Liturgical Translations,” by Ronald D. Witherup, S.S. (10/7). I especially appreciated the author’s refusal to categorize every translation ever made into the either/or Procrustean bed of “literal” versus “dynamic.” As he rightly says, there is a continuum of literal fidelity to the original text; and the decision about where to place a particular translation often depends on the nature of that original. But I wonder if the Bible, with its famous “paratactic” style (short independent clauses strung together, with very few lengthy subordinate clauses attached) is all that hard to translate literally. The Bible has value precisely for its simplicity and accessibility to the barely literate. This simplicity of style must surely be the reason why the Revised Standard Version and the New International Version, both explicitly and deliberately literal translations, remain the most popular in Protestant churches and with the book buying public. This translation is not only garishly ungrammatical (“humankind” and “human race” are singular nouns, but their attendant pronouns are plural); it is also irritatingly unpleasant to the ear. The fact that such a weird rendering would not strike every member of the ICEL translation team as being obviously off key only goes to prove the truth lurking in the old joke about the camel being the one mammal produced by a committee. It also reminds us that this entire dispute is one that could easily wipe out the memory of the historical cadences of the Bible from the worshiping church. This article also appeared in print, under the headline "ICEL and Liturgical Translations," in the October 7, 2000 issue. Ronald D. Witherup, S.S., a former professor of sacred Scripture at St. Patrick’s Seminary in Menlo Park, Calif., is the author of A Liturgist’s Guide to Inclusive Language (1996).